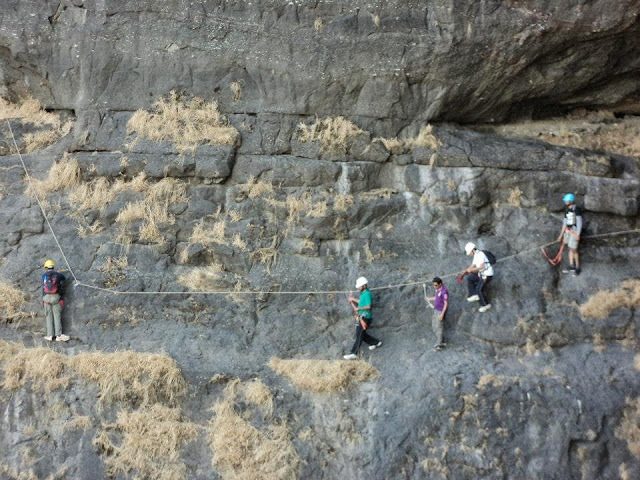 Can u see the Rappeller?? Everyone should reach Lonavala Station, Jaichand chowk by 8 AM. People from Mumbai should take Indrayani Express. Reach lonavala station, finish breakfast, get into vehicle to reach base village Kurwande. 1. A haversack to put in all the things to be carried. So that one has hands free while trekking. 2. A bottle of water (3 Ltrs). 4. Electoral / Enerzyl powder, 2 Lemon, some snacks & biscuits (optional). 5. Torch with extra batteries. 6. Personal medicines & 2 plastic bags for weight distribution, mosquito’s cream. 7. A good trekking shoes. 9. Scarf for Ladies is a MUST while rappelling.